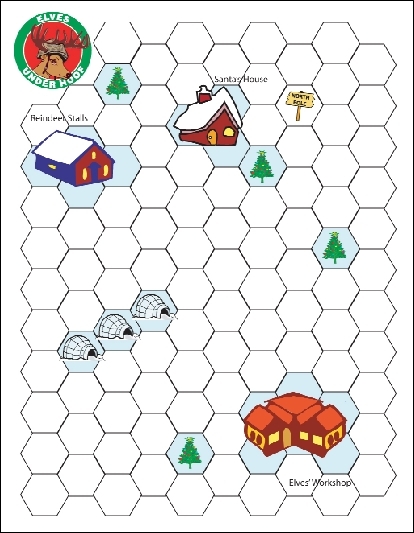 Elves Under Hoof is a light-hearted game of combat at the North Pole. It seems the elves have opened up a crate of ultra-violent video games and played them all night. By morning they had been turned into mindless zombie elves bent on destruction. Now, it is up to your team of heroic reindeer to gather weapons and battle the crazed elves to save the day! This is a solitaire game, which means you get to do everything and as fast as you like! No more waiting for slow or half-witted opponents to make up their minds or wander off to the bathroom. - Very easy to play. - Armed reindeer take on the evil elves. - Just in time for the holidays! - Just the thing to remind you of Christmas! This is a great game for both wargamers and non-gamers alike. The game is fast and easy to understand and who doesn’t like throwing hand grenades at elves? Gian Marco Franco 10 9 10 A good introductory wargame for children, my son, 7 years old enjoy It very much! george snodgrass 8 8 8 Great Fun! nothing heavy. My wife played, she never plays hex and counter! Shaun Whiter 10 8 7 Easy to make, learn and play. With the aid of the play mat you can pretty much start playing straight away, and the scenerios provided help with replayability. All in all a fun well playtested game that is worth the time to make and play.